If there is one thing I want you to take away from this review, it is this: EVA is not a Mainland Chinese carrier. So often, we encounter reluctance to flying EVA from Award Expert clients. The usual response goes something like this: “Oh, we don’t like Chinese carriers”. By that, they invariably mean Mainland Chinese carriers. And although many Mainland carriers have greatly improved, that response is understandable. After all, who wants to fly in an ashtray? EVA is a Taiwan-based airline and member of the Star Alliance network. Its worldwide route network includes North America, Europe, and Australia. EVA’s longhaul fleet is composed of 777-300s, A330-200s, and 747-400s (which will be retired later this year). All longhaul flights have lie-flat seating and both service and food is exceptional. Not just good, exceptional. I had the chance to fly abroad an EVA 777-300ER from Amsterdam to Taipei with a stop in Bangkok in business class as part of my Star Alliance Business Class Adventure in Europe and Asia. After a delayed start to our flight, which EVA handed extremely well, we boarded for the first portion of our flight, an 11hr journey to Bangkok. This was a late night flight, now pushing midnight, so boarding was quick and FAs helped to get every passenger settled quickly. Nevertheless, FA still offered a pre-departure beverage, warm towel, and menus prior to takeoff. EVA introduced a reverse herringbone seat on its 777 long before many of its competitors. Since we were traveling together, my brother and I chose a section of two seats in the middle. Seats are spacious with plenty of personal storage. The Royal Laurel cabin contains 27 seats divided into two cabins. We were seated in the rear cabin. In terms of bedding, a comfortable blanket and pillow were waiting on my seat. EVA has since introduced a new plusher blanket, pillow and mattress pad, so know that bedding has improved even more since my flight. Pajamas are now also avaibale. The bed is spacious enough even for a tall person and my feet did not feel constrained in the “cubby hole”. EVA shines in the food and beverage department. As usual, I stuck to the western menu options and found both the quality and portion sizes wonderful. A couple notes. First, EVA rotates its champagne. My flight had Dom 2003 but recently we have seen Krug or Veuve Clicquot La Grande Dame 2006. Second, menu appearances and tablecloths have changed, but the food itself has not. You can still order in advance online and whatever you eat, expect a high-quality meal. The meal began with a seafood appetizer, which I passed on. I did enjoy the garlic bread and fresh carrot juice. Cheese and dessert were served by cart and I opted to try cheese, cake, fruit and ice cream. All were excellent. FAs were so happy to see me seat since most in the cabin went right to sleep. After almost no sleep the previous night, I fell asleep after the meal service and slept for 7.5 hours straight. Success! I should note both meal services were efficient: not quite as fast as on competitor China Airlines, but very efficient. Due to the late hour, that was appreciated. EVA offers noise cancelling headphones (good, but not great) and has an IFE library with a large selection of movies and TV shows from around the world. Seat-to-seat calling is also available and complimentary. Wi-Fi is supplied by T-Mobile and costs $21.95 for a day pass. I watched a French movie called Love is in the Air which takes place wholly onboard a daytime from New York to Paris. I enjoyed it! Another thing I love about EVA: the amenity kit is from Rimowa! Thai Airways and Lufthansa also offer Rimowa amenity kits, but only to first class passengers. BR76 makes a ground stop in Bangkok. All passengers were forced to exit the aircraft during the 90-minutes on the ground. Business class passengers were escorted through security and to the EVA Lounge, which was a bit crowded. We re-boarded from Gate G3 and took off, again precisely two hours late. A new cabin crew welcomed us onboard. New Rimowa amenity kits were not given out, but all blankets had neatly been folded (or hopefully replaced). Mixed nuts and rice crackers to start. The main course was very tasty, with the salmon cooked to a perfect texture. Not bad for a 3hr, 40min flight! Other than the delay, I don’t have a bad thing to say about the flight. FAs were pleasant and attentive, the seat is comfortable, food was great, and EVA has the best amenity kit and champagne in business class. I highly recommend EVA Royal Laurel Business Class. 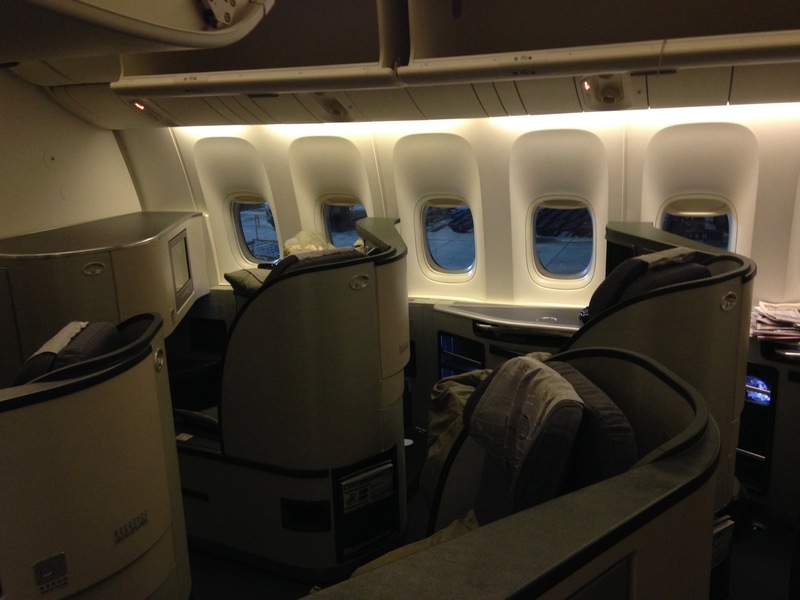 For a more recent review, check out Lucky’s recent flight from LAX-TPE. You’ll see some of the differences I noted, but also that business class hasn’t changed much since my flight. Previous Article Am I the Only One Who Doesn’t Use Hotel Deadbolts? Thanks but I think you got the date wrong…according to the BKK G3 sign, this was October 4 2013. Thanks! That was a typo on the date — meant to write 3 instead of 4. Lounge will be open … very annoying to go through security and re-clear, but it goes quickly at least. Your typed year of flight -2014- doesn’t match the airport display reading 2013.
thanks JoeMart for pointing out how this review is,I gather, for a flight taken two and a half years ago, or maybe much longer! Matthew, I understand it is your blog and you can post whatever you wish, for but for what it is worth from one reader, I really felt duped when I noticed from the comment above that the review was about something that took place so long ago. I enjoy your blog, and I understand frequent travelers go back a bit to catch up on posting, but this just seems really really excessive. Would you consider flagging in the title and a bit more explicitly for those of us who don’t read every shred of text carefully, that we are reading, or about to read, something that is this out of date. Hi Kate, I appreciate your reading my blog and have written a special post explaining why I post old trip reports and make no attempt to hide the actual date of the flight. On the contrary, I clearly list it at the top of the review. It wasn’t JoeMart who unearthed it, but I who stated it. While I understand you may feel “duped”, every older report clearly distinguishes what may have changed between then and today. I have had disappointing experiences on Air China, China Southern, and China Eastern so I understand why clients are hesitant. Still, I would have no hesitation flying a Mainland carrier again except for China Eastern (due to smoking). I hope to fly Hainan soon. Cathay has a subpar business product. Every frequent flyer knows that. The seat is good (but quality is questionable on their new 350s), but the food is borderline terrible, the crew understaffed and amenities average at best. I refuse to fly EVA Laurel Business any more. In total I’ve flown 8 times (over 2 years 2015-16) and only on 2 flights did I get cabins where you can sleep full throttle. My flights have been from Singapore-Taipei-Vancouver. The leg from Singapore to Taipei is deceptive. For such a short flight you have cabins that allow you to recline fully in bed like fashion. But on the longer stretch over 11 hours it’s 2 seats – broader that Premium but no full recline. The proximity of the seat beside me is too close for comfort especially if it’s a total stranger next to you. So you really chance it when you book Laurel Business Class. My first time – I was really impressed with the service and full recline. The next time around I had the full recline only on the return. I’ve now switched to Cathay – my lastest Business booking was cheaper than EVA and I know for sure I’ll be getting the full recline. I have flown in J on the TPE-JFK route, and found the seat/bed to be very comfortable and easy to get a good night sleep. I have been disappointed by the food though, and think it strange that they often have no Chinese option. IFE could also be better. Overall, I find CX better, and prefer to transit in HKG, but I would be happy to fly EVA again.